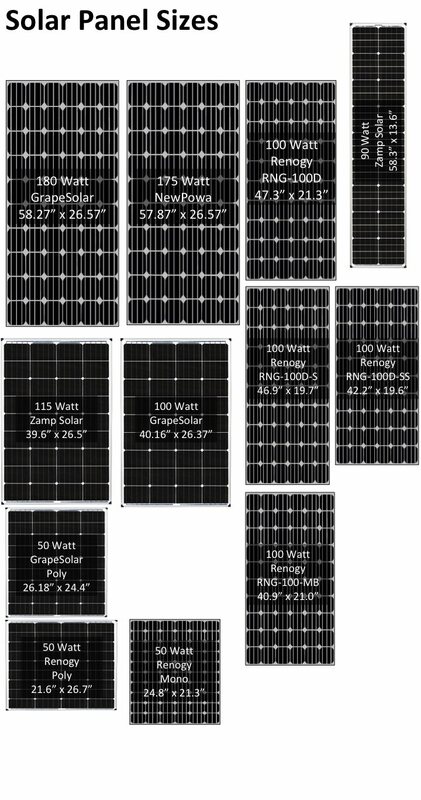 I'm looking at how to mount solar panels on the roof, and I spent a few hours with a measuring tape and a computer making the following diagrams. Everything is to scale, and it made it super easy to be able to move the panels around as I'm trying to figure out what size to order and how I could lay them out. 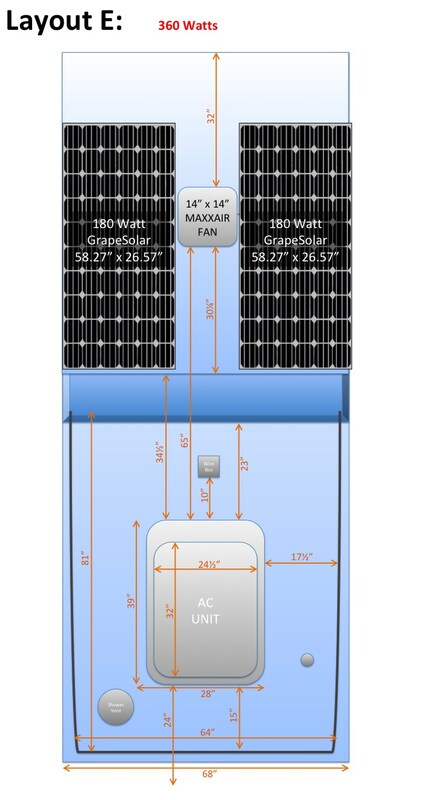 I figured I'd show you guys the images in case anyone was wondering how big certain panels actually are on the roof, and to see what you guys thought of the four options I've come up with, or if you have any better suggestions. 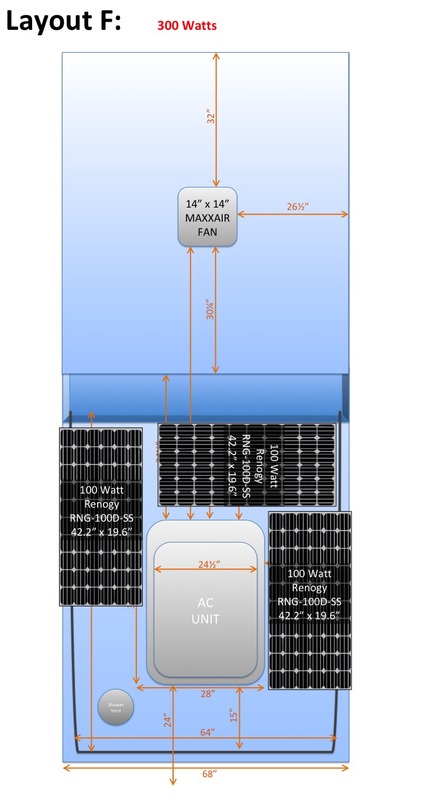 My main goal is to cram as much wattage as possible on the roof, without having to resort to penetrating the fiberglass surface or increasing the height of the vehicle appreciably. I think the best way to do this is to bolt some cross-bars to the stock roof railing. The plans are in order of what I think is best, A being my first plan... E being my last. Layout A requires mounting a panel onto the top of the Airconditioner housing. I think this would be OK, and we could even drill holes in the housing for brackets without damaging the roof of the van. 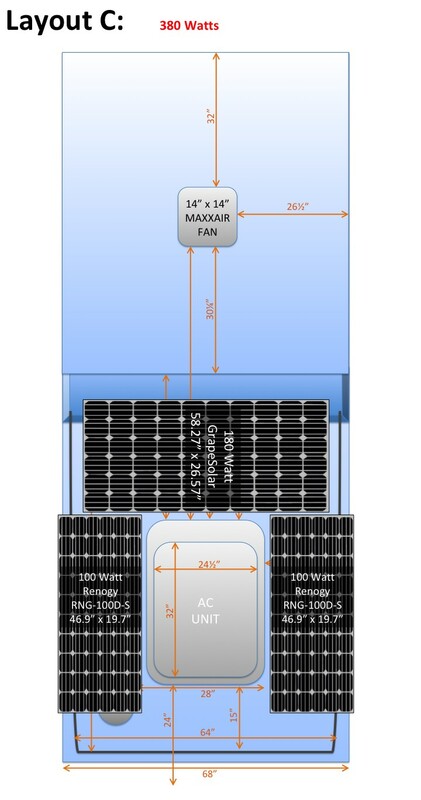 The 180 watt panel could easily be attached to support beams mounted across the pre-installed railing on the aft half of the van. Layout C would mount three panels on beams across the pre-installed railing. 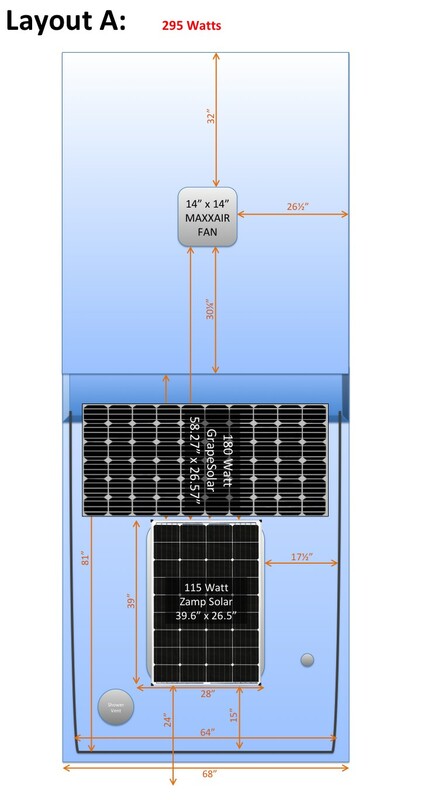 The 100 watt panels might hang over the edge of the van slightly, but would still be within the footprint of the van mostly. 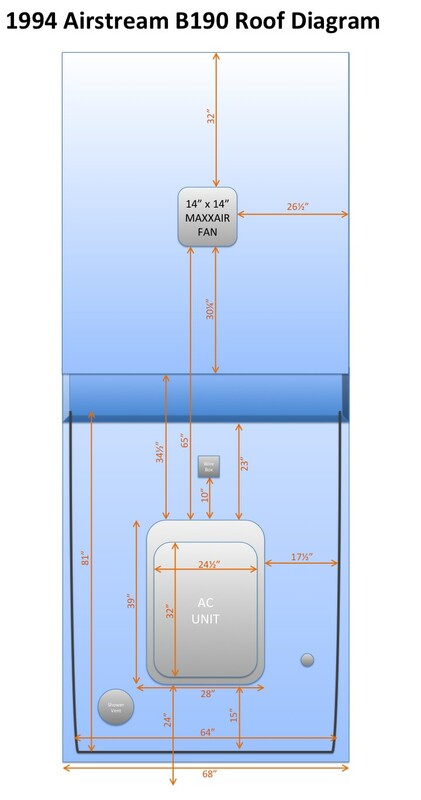 Layout D is the same as C, but modified to just two panels incase we cannot install something over the shower-vent without blocking it, although blocking it may not be a problem anyway. Layout E is my least likely. It would require mounting either with sticky feet or drilling holes, as the railing does not extend that far forward. I'd like to keep the install easy with just two 180 watt panels, however I want to keep the in the back half of the van which has a railing to mount to, and is several inches shorter than the front half. If anyone wants the powerpoint file that these are saved in, so you can drag and manipulate panel locations for your own layouts or diagrams, feel free to PM me your e-mail and I will send it to you. Last edited by Millennial Falcon on Thu Oct 18, 2018 6:15 pm, edited 4 times in total. 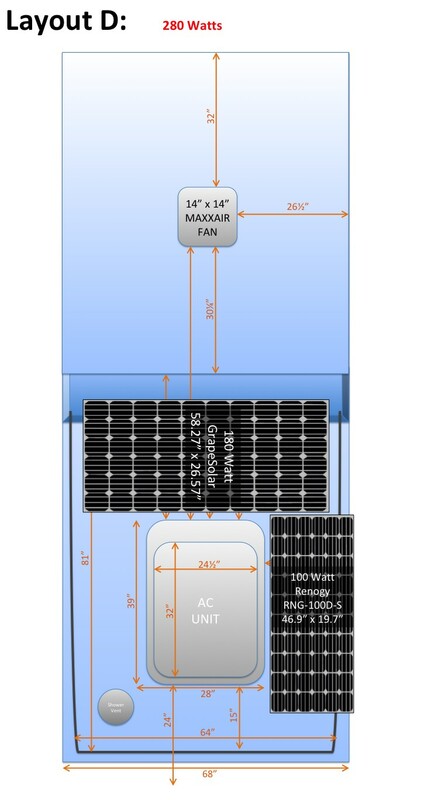 Nice layout ideas mine is mounted cross way right behind the fantastic fan 150w. It is hard mounted to the roof and sealed with self leveling sealant. I would rather trust a hard mounted than trying to use adhesive. If you lose one and cause a accident its on you legally. 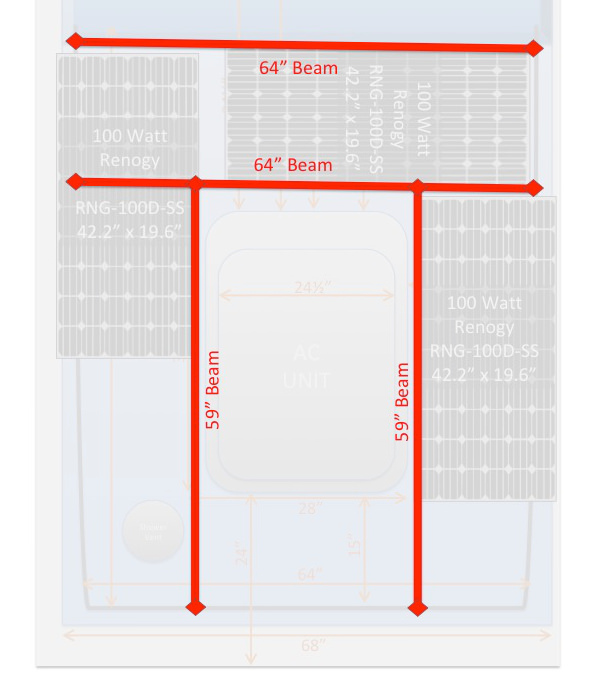 Well, today I ordered 3 of the Renogy 100 Watt Compact Panels, they're thin enough I should be able to easily mount them alongside the AirCon without having any overhang off the outboard sides of the camper top. I'll let you all know how it goes!! 25 amps should be plenty. What batteries are you using? What batteries are you using? I'm using two 100ah Lithium Batteries, from Battleborn. The 200Ah Adventure in a Backpack bundle, to be precise. Nice system lithium ion batteries are great but a little temperamental in cold weather is the only downside I've seen a couple videos on installs the batteries had built in heather's to keep themselves warm enough to charge. Thought that was a good idea. Post some pictures when its finished I would like to see it. Thanks for posting these. I used them when we were trying to figure out where to mount my panel at the van build in November and again now that I'm looking to add more panels. How did your system turn out? What about the Battleborn batteries? I can't afford them now, but that's an upgrade I'd like to do someday. 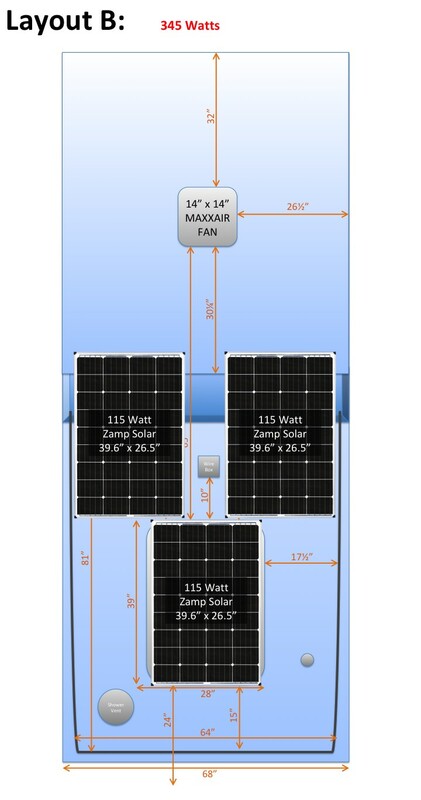 I noticed that Nomadic Fanatic just installed some and 1200W of solar and can run his AC on them.